Creowave is attending Atyrau Oil&Gas Exhibition in Kazakhstan from April 9th to 11th . Atyrau Oil&Gas is a regional event of the global industry. This event is unique and has no analogues in Atyrau region, in the region which is key and strategically important in the scale of oil and gas industry and national economy in general. Atyrau city – Oil capital of Kazakhstan – is a member of the World Energy Cities Partnership (WECP), which includes 18 Oil Capitals of the countries. Creowave will be presenting C-Site remote monitoring system and what kind of applications it can be used for. Come meet us in the exhibition, tell us your challenges and we will offer our best solution for it. Creowave is attending Australasian Oil&Gas Exhibition and Conference in Perth, Australia from March 13th to 15th . The annual Australasian Oil&Gas Exhibition and Conference is the platform event for the Australian oil and gas industry featuring over 250 exhibiting brands and over 8,000 global visitors. AOG is a showcase of the latest products and services and is also providing opportunities to network and learn about the latest technological and innovative breakthroughs which will drive the industry into the future. Creowave will be presenting how C-Site remote monitoring system works and what kind of applications it can be used for. Welcome to stand M18, tell us your challenges and we will offer our best solution for it. Creowave is attending Comms Connect in Melbourne, Australia from November 21st to November 22nd . Comms Connect is the number one event for critical communications users and industry in the region. With a keen eye on trends, hot topics and the latest technology solutions in the critical communications sector, Comms Connect is the key source for vital information and networking opportunities. Whether you’re in the resource sector or public safety, transport or utilities, security or consulting, the conference and exhibition delivers countless opportunities to seek out new technology, share ideas and make new contacts. Creowave will be presenting how C-Site remote monitoring system works and what kind of applications it can be used for. Welcome to stand 7, tell us your challenges and we will offer our best solution for it. Creowave is attending Energia 2018 energy event in Tampere, Finland from October 23rd to October 25th . Energia 2018 gathers the fields best technology and machinery, toughest experts and operators and the most current topics. Energia 2018 offers the latest and most accurate information on energy production, transmission, distribution and storing. Creowave will be presenting how C-Site remote monitoring system works and what kind of applications it can be used for. Welcome to booth A901, tell us your challenges and we will offer our best solution for it. Creowave has been rewarded with Company of the Year 2017 award. The award was granted by the Entrepreneurs of Oulunsalo association in Oulu region. According to Mira Sovijärvi, the chairman, the choice was unanimous based on the excellence of the company and its products. -We are extremely delighted to be announced as the Company of the Year. We have succeeded to ensure our business in the challenging years when the oil and gas industry have been in turning point. The future looks promising for us, comments Jyrki Koski, the CEO of the company. The strength of our company is the excellent know-how and the flexibility of the company. We can answer the needs of a customer very quickly and solve the challenges with our solutions, he concludes. 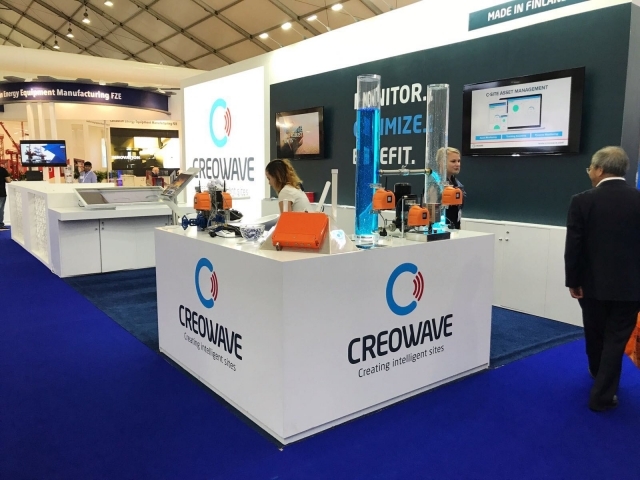 Creowave took part in ADIPEC, The Abu Dhabi International Petroleum Exhibition and Conference, held between 13th and 16th November. Creowave has been an exhibitor at the event already several years. This year the company launched C-site Tracking Solutions at the event providing solutions for personnel tracking, asset tracking and security. – The exhibition was a great success for us. The interest for our new product family has been very encouraging. The need for personnel tracking is evident in every industry and will make the world a safer place, comments Jasmin Al Amir, the Sales Engineer of the company. In addition to the tracking solutions the Asset Management solutions were showcased including the C-site system which enables the user to monitor, measure and analyse the assets required and have the data available real-time on any device. – The feedback and discussions at the exhibition were very interesting. There is an active need for solutions that we provide. The efficiency and predictive maintenance in all operations together with security and HSE aspect is something that is currently needed by many customers. We are very pleased with the outcome of the exhibition. We continue the growth and presence in Middle East also in 2018, comments Teemu Vähäkangas, the Vice President of Creowave Oy. Creowave continues to grow in the Middle East by establishing a joint venture to Doha, Qatar. The new subsidiary, Creowave Technologies International, is a joint venture with a local partner. “The establishment of Creowave Technologies International is a great step forward to develop our business in Qatar. By having a local office in Doha we will be able to better meet our customers’ requirements and provide local support”, comments Teemu Vähäkangas, the CEO of the Creowave Technologies International. The parent company, Creowave, will continue to expand and to serve its customers locally, by partners, subsidiaries or joint ventures. Headquarters of the company will remain in Oulu, Finland. “We are very excited of the new company. This will be the first step for us on establishing a strong presence in the Qatar market. The need for our solutions exists and to help our customers in their challenges, we will need to be locally present. Our plan is to grow and support the C-site sales and deliveries worldwide”, comments Jyrki Koski, the CEO of Creowave. Learn more about Creowave Technologies International from the recently launched new websites. ADIPEC, the world´s largest exhibition for oil and gas takes place in Abu Dhabi between 13th and 16th November. Creowave group is present at the event on stand 13752. We welcome You to visit our stand and discuss various asset monitoring and process measurement solutions. Creowave will be attending the SPE Annual Technical conference and exhibition in Dubai. The event will be held in the Dubai World Trade Center on 26-28th of September 2016.